The following article was from Woman's Weekly, 27th June 2006 and compiled by Nutrition expert Judith Wills who has picked her top ten fruits for the extra-special health benefits they provide. 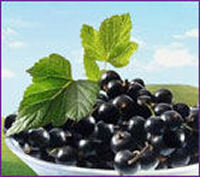 Blueberries rate at 2,400 on the ORAC scale (see Cherries), beaten only by Chinese wolfberries! One of the major plant chemicals found in blueberries is anthocyanins, antioxidant compounds (substances that help prevent a range of diseases and can help with anti-ageing) that seem to have almost amazing benefits for health. They can help prevent diabetes: according to research from Michigan State University, USA, it's possible that consumption of fruits containing anthocyanins could have a significant impact on insulin levels in humans. A portion of blueberries (about 70g) can stimulate the growth of new brain cells, can help prevent memory loss and Alzheimer's and protect against cancer. 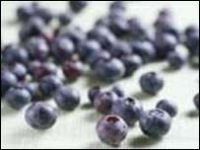 Blueberries are also anti-inflammatory, anti-bacterial and can help prevent blood clots. Another newly discovered compound in these berries, pterostilbene, lowers blood cholesterol and may fight cancer and heart disease. As a bonus, blueberries can also help keep your skin younger looking. TIP: Raspberries, blackberries and blackcurrants are also good sources of anthocyanins. A portion of two plums (100g) contains a massive 240mg of potassium (helps beat fluid retention) and 1.5g fibre. 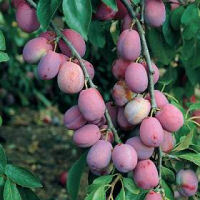 Plums are also high in vitamin E, which helps to keep your blood and heart healthy. Go for red plums, such as the classic English Victoria, which contain a lot of beta-carotene, the antioxidant plant chemical which can help to protect your skin from sunburn and which is also anti-cancer. Plums are one of the lowest Glycaemic Index fruits, so they're useful for dieters and people with insulin resistance and diabetes. Purple-skinned plums contain similar beneficial plant chemicals to purple berries (see Blueberries, Blackcurrants), as well as high levels of ferulic acid, a compound, which can help prevent colon cancer. TIP: If you stew plums, cook them in a little water and drink the juice that forms as the ferulic acid leaches into the water. Deep crimson raspberries —and their cousins, tayberries and loganberries — are some of the healthiest fruits you can find in the shops throughout summer and early autumn. With 2.5g fibre per 100g, they are one of the highest-fibre fresh fruits you can find, and they're also high in vitamin E, an antioxidant, and potassium. In addition to vitamin E, they are bursting with antioxidants including quercetin, lutein, and myricetin. They also contain tannins, which research shows can help to protect us against viral infections. 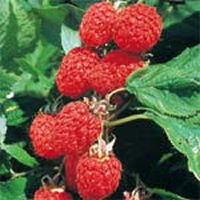 TIP: For the most benefit, eat your raspberries before they begin to turn purple. Using the ORAC (Oxygen Radical Absorbance Capacity) score for a food's antioxidant capabilities, cherries are among the ten highest fruits reported in tests by the US Department of Agriculture; 100g of sweet cherries has an ORAC score of 580. Cherries are high in anthocyanins (see Blueberries), though they're not as rich in them as blueberries. The compounds are found in both sweet and sour cherry varieties, while sour cherries (often sold for cooking) are high in melatonin, a compound that can help beat insomnia. TIP: Black cherry juice is said to fight tooth decay. The luscious red berries are our favourite summer fruit, and they're much more healthy than most of us realise. A small (100g) serving of strawberries contains just 27 calories (and is virtually fat-free), and around 80mg vitamin C - that's 20mg more than your recommended daily intake (RDA) and more than an orange. 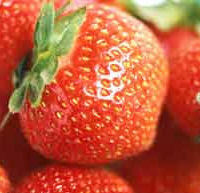 Strawberries can also help whiten your teeth - the acids in the fruit help to remove stains. They are full of a special plant chemical called ellagic acid which can help fight cancers and are also full of flavonoids, which form part of the strawberry's red colour, and are known to help reduce cholesterol and help to prevent it clogging up our arteries. 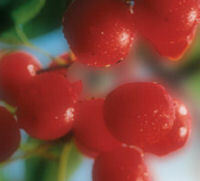 TIP: The fewer white bits the berries contain, and the redder the fruit, the more ellagic acid will be present. Mangoes are one of the richest sources of the carotenoid compound beta-cryptoxanthin, a cancer-fighting chemical which is especially good at fighting cervical, colon and breast cancers. Carotenoids help prevent sun damage, too. Mangoes are also rich in vitamin C (just one fruit contains around 80mg) and vitamin E (around 2mg per fruit), and contain about 5g fibre per fruit. TIP: When eating mangoes as part of a meal, the carotenes are best absorbed when a little fat is added to the dish. Rich in vitamin E and potassium, avocados also provide a great source of monounsaturated fats and beta-sitosterols, both of which can help lower "bad" LDL cholesterol levels in the blood, vitamin B6. and fibre — and a wide range of other vitamins and minerals. Its high oil content means that it has a high satiety value, so is ideal for helping keep hunger pangs at bay and regulating blood sugars. 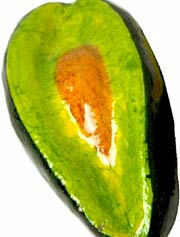 TIP: Avocados are great sliced into leaf salads or mashed with a little spring onion and chopped tomato for a quick dip. For a sweet and delicious late-summer treat, you can't beat fresh figs. They contain only around 20 calories each and so make an ideal healthy dessert with some creme fraiche, or just halved and eaten as they are. help keep blood-sugar levels even, as they are low on the Glycaemic Index. 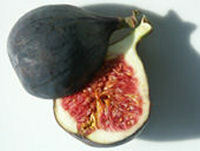 Lastly, figs are an alkaline fruit and can help to counteract the acidity of meats and a highly refined diet. TIP: Figs make an ideal between-meals snack, as they help to prevent hunger. These aromatic fruits of summer are one of the very best sources of vitamin C, containing 130mg per 100g portion (stewed). They are also rich in anthocyanins which can help fight against all kinds of disease (see Blueberries) and may help to protect against urinary infections and even eye strain. a great source of calcium, iron and vitamin E.
TIP: To cut down on the amount of sugar needed to sweeten blackcurrants, try adding fructose (after cooking) instead. It is twice as sweet as sugar. While rhubarb is officially classified as a vegetable, because the edible part is the stalk, not a fruit, most people think of rhubarb as a typical seasonal fruit. It has been recorded for centuries that rhubarb is a liver cleanser and a well-known laxative. After years in the culinary doldrums, rhubarb sales are now growing 100 per cent year on year. Rhubarb is extremely low in calories at just 7 per 100g (one medium stalk), but high in fibre and potassium. However, don't eat too much at once as it's rich in oxalic acid, which can cause digestive upsets if you overindulge (avoid it if you have kidney stones). TIP: Rhubarb is high in calcium, but this is not well absorbed in the body because of the fruit's oxalic acid content.